Although the SPX lost over 2% it's still possible that we'll see new highs this week before the correction should start. I labeled today's gap down as a wave (i) and the rest of the day as a wave (ii). Wave (iii) should follow tomorrow and break all these support lines. We are still in wave 4 (flat). 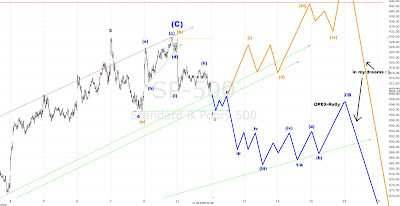 Wave 5 of (C) should start tomorrow and make new highs later this week.